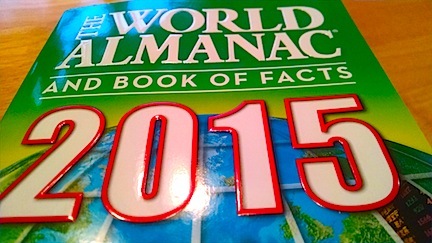 IT TOOK me five years to buy a new one (a lapse of sanity, surely), but just the other day I purchased a copy of the The World Almanac and Book of Facts 2015. Now, at my fingertips and within a scan of my eyes is a mountain of interesting facts, statistics, and history that would take me hours to compile looking through Wikipedia or any of its iterations on the Internet. Why do I love my World Almanac so? Because I can flip pages, take in a quick dose of information and add that to my appreciation of the world around me. It is a fast way to build my knowledge base. A base of information that goes into the scaffolding of my mind and allows me to understand and analyze trends, motivations, and history being made as we speak. Scope is the old fashioned word people used to use to describe this, or even “a wide knowledge of the world.” You get that from books like the Almanac. TRIVIA. A lot of people think that’s what a book like the Almanac is for. But isn’t life really about the “trivia”? The little things that happen each day make up what become the trends of our lives. So, trivia, factoids, added together make history!